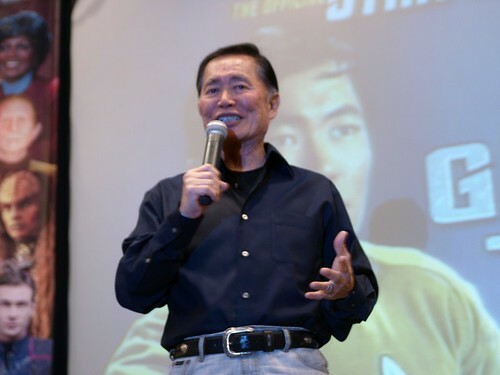 Last weekend was Creation Entertainment’s second Star Trek convention in Vancouver Canada with a guest list that included Nichelle Nichols, George Takei, Dominic Keating, Connor Trinneer, Rene Auberjonois, Nana Visitor, Barbara March, Gwyneth Walsh, J.G. Hertzler, and Robert O’Reillye. See below for our full report with photos from the con. I was not able to make it on Friday, but a friend reports that Star Trek: Enterprise stars Dominic Keating and Connor Trinneer were very entertaining, retelling memories made on the Enterprise set and convulsing the audience with a story about Dominic’s command of colorful language. For fans worried about Connor’s recent knee surgery, all is well, and although a frightening blood clot could have been life threatening, he is now on his way to a full recovery. The guest line-up on Saturday was exciting, beginning with one of Star Trek’s most influential actresses – the incomparable Nichelle Nichols. Greeted with the only standing ovation of the convention, Nichols was graceful and articulate, and won the hearts of the Vancouver audience by cheering on the local NHL Canucks. 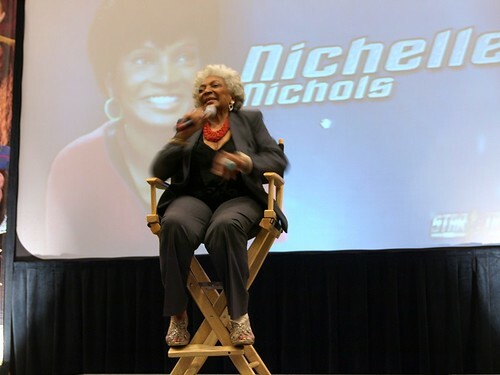 Nichelle spoke of her time at NASA, and even shared a small performance of Star Trek’s original theme. Repeating her challenge to NASA, she proudly proclaimed “To boldly go where no WOMAN! … or man has gone before!”, reminding the audience that Lt. Uhura had been fourth in command of the Enterprise. 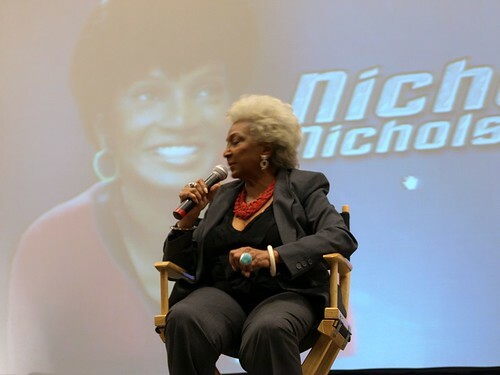 Nichelle concluded with a charming anecdote of her conversation with Zoe Saldana on the set of the 2009 Star Trek film, which may have strengthened Saldana’s portrayal of the iconic character. The theme of strong women continued with an appearance by the Star Trek: The Next Generation’s Klingon Duras sisters – Barbara March and Gwyneth Walsh. 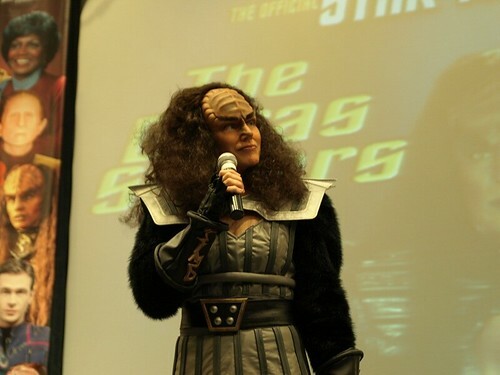 Appearing in full Klingon costume (teeth included), the classically trained actresses drew an analogy between Lursa and B’Tor and the daughters of King Lear. They shared their experience of having met before their work on Star Trek, and even speculated with the audience as to why a new Trek series hasn’t been produced. 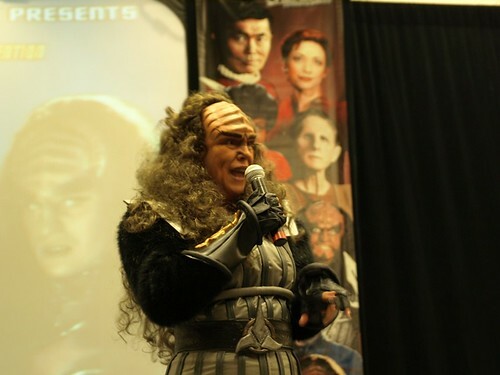 Admitting that neither could really speak Klingon, they delighted fans with their classic scene; “Human females are so repulsive”! Up next was Star Trek’s most energetic alumni, George Takei. 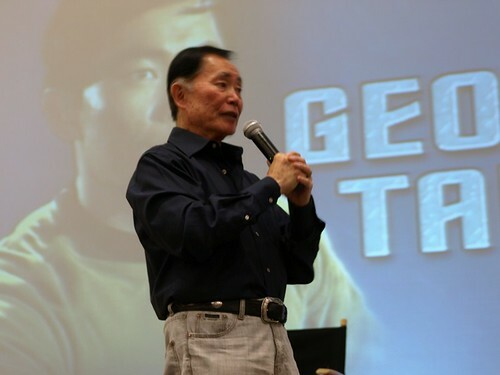 Eagerly answering questions and interacting with the audience, George promoted his current and upcoming works including Supah Ninjas and Allegiance – an in-production Broadway musical about George’s experience in an American Japanese internment camp. George was visibly moved at the change to share his experiences through performance. In turn, George also impressed the audience when he described his work to ensure that dialogue about homosexuality is an option for adolescents in some repressive American communities. 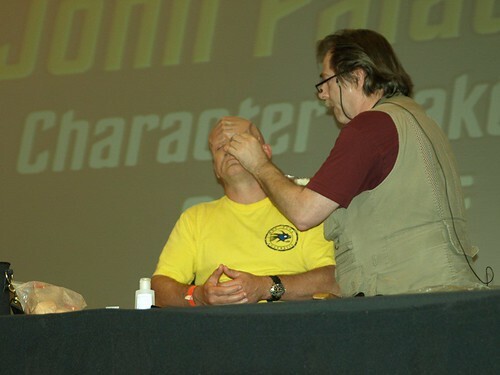 The Klingons returned again when specialty make-up artist John Paladin demonstrated his craft. While turning a cheerful Aussie into a menacing Klingon, John entertained the audience with anecdotes and tips on doing your own theatrical makeup. 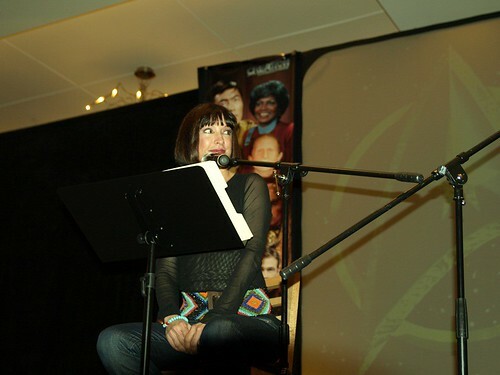 The popular Klingon Breakfast launched the final day of the convention, setting the stage for appearances by J.G. 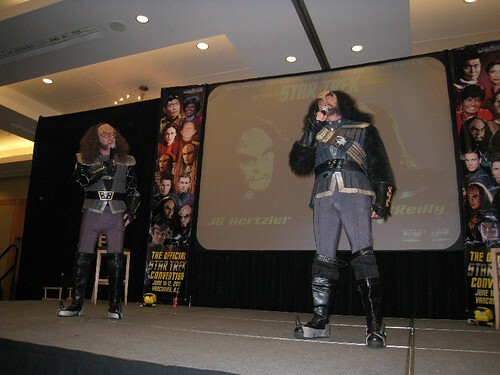 Hertzler and Robert O’Reilly in full Klingon gear. Looking remarkably like a Klingon ZZ Top, J.G. and Robert danced, air guitar-ed, and bantered with the audience. 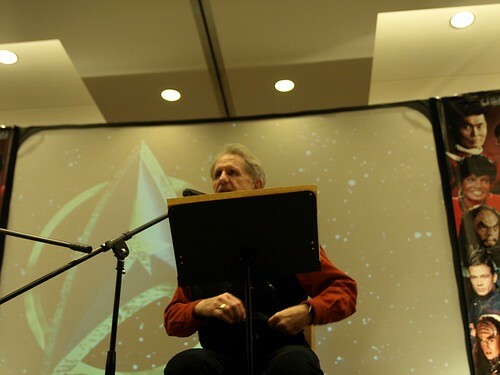 Martok even threatened one of the younger audience members, humorously heckling him throughout the performance. 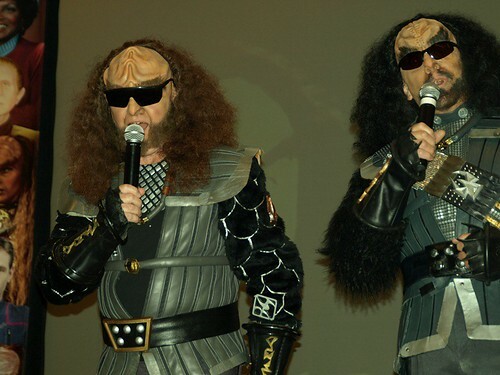 Donning sunglasses surrendered by brave audience members, Gowron and Martok previewed their cabaret act to be performed later this summer at Creation Entertainment’s Las Vegas convention. On the final afternoon, Deep Space Nine fans were rewarded for their patience with appearances by Rene Auberjonois and the stunning Nana Visitor. Nana shared her newfound love of hiking (and accompanying concern for rattlesnakes), her recent work on Torchwood, and her excitement at moving back to Los Angeles. Rene spoke enthusiastically about his work on Bored To Death with Zak Galifinakis, the joy he finds in his family, and then joined Nana. Together, they reminisced about their time on DS9. After a brief intermission, Nana and Rene brought great emotion to the audience with “Cross Our Hearts: Poems and Prose read by Nana Visitor and Rene Auberjonois”. Fans were treated to an impassioned performance of poems, short stories and quotes. 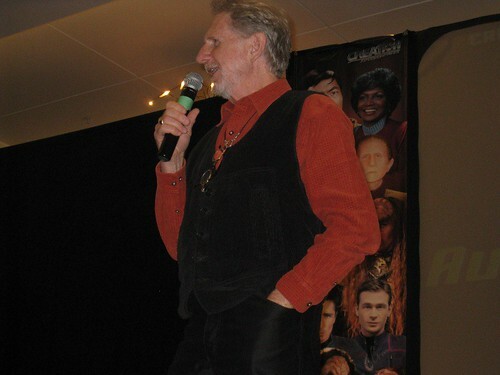 The audience held their breath as Nana and Rene recreated a scene as Odo and Kira, foreshadowing their eventual love. The dramatic performance reinforced to attendees the undeniable theatrical talents of the actors engaged in the Star Trek franchise. Fans too showcased their transformative abilities in the costume contest, where three alien women took first, second and third prizes, including yours truly coming in second as an Orion. A select group of fans capped off their Saturday evening with an intimate cocktail party that gave them a cherished opportunity to converse informally with the stars. Off stage, the actors got to know their fans on a personal level, laughing and joking, sharing stories of careers, parenting, and hobbies. 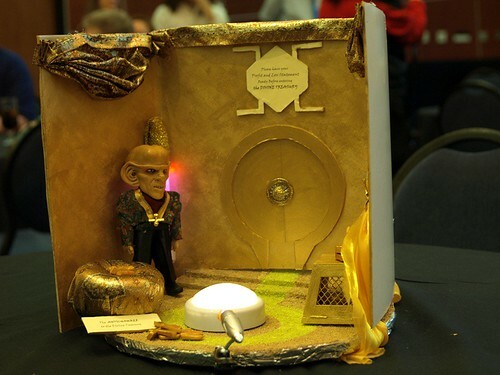 A tribute to the Quark’s nightmare in the Ferengi Divine Treasury took first place in the accompanying centerpiece contest. Finally, exhausted and exhilarated fans, clutching their signed memorabilia, waved goodbye to their fellow Trekkies, and set a course for home. The success of this convention cemented the gorgeous Vancouver venue as a location for future Star Trek events, and fans looks forward to Trek returning to Canada’s west coast once more. Alex Martinuik (aka "The Star Trek Girl") can be found on Twitter at @thestartrekgirl. She also has a regular video blog on YouTube (Warp9Engage). Her is her vblog from the con itself. Now come to Las Vegas and realy have a Glorious time. I completely admire those actors for dressing up in their Klingon regalia and doing a bit of live dialogue. It takes a lot of balls to do…. the fans LOVE to see the “characters as characters” in person. Countless decades of conventions the mainstream TOS and TNG cast have been asked to do some dialogue from a random scene and they refuse, which we all understand. But it would blow everyone’s f*cking mind if the TNG crew came on stage together in full uniform. Remember that semi-odd “Spock vs Q” live reading years ago? Imagine Nimoy and DeLancie did that in costume? Gowron and Martok = The Koolest Klingons. Looked like a lot of fun. 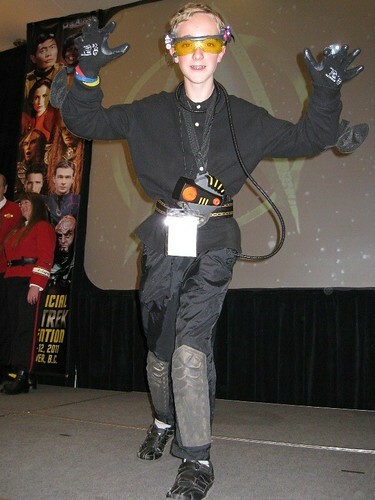 I wish we had a Star Trek convention in Ohio, say Columbus so everybody in the state can easily reach it. This was a great Con, everybody was lots of fun! Rene Auberjonois & Nana Visitor’s performance was unbelievable. George Takei & Connor Trinneer were particularly hilarious, too. And the Klingon rap was an absolute show stopper! If you want to have a great fan experience in one of the most beautiful cities in North America, you should come to Vancouver next year. Well, its a good thing this convention was held a few days ago instead of on the upcoming weekend, as there are huge riots going on in Vancouver. Cars being burned, vandalism, looting, beatings, cops beating up people and arresting them. Vancouver Canucks lost game 7 and the Stanley Cup to the Boston Bruins. Bruins 4, Canucks, 0. Riots also happened in 1994, when the Canucks lost in seven games to the New York Rangers. So Red Dead Ryan, the cops shouldn’t arrest the asshats burning cars, vandalizing, looting, and beating on people… speaking off asshats how does yours fit? 10…. what is it that is making you respond so hostile? I don’t get the impression he was bashing the police…. just setting the scene. An accurate scene…. I lived in Vancouver for 5 years. I watched CBC coverage last night… all the people causing crap downtown weren’t hockey fans. They were the confused drugged-out skinny meth addicts that litter most of that city. Even if Vancouver had won, you would’ve seen the same stuff go down. Police should be shooting them one-by-one in the head. Not beating them up or arresting them. These “riots” are a great way to weed out the dregs of society. And if your car was the one on fire last night, you’d agree. I guess you were one of the idiots who took part in the disgraceful display of hooligansim? Agreed. I am amazed it took this long for someone to mention it. It takes a real dolt to say something like that. You see, TNG was a TV show that happened many years back. As is common to people that exist in reality, Robert O’Reilly has aged. 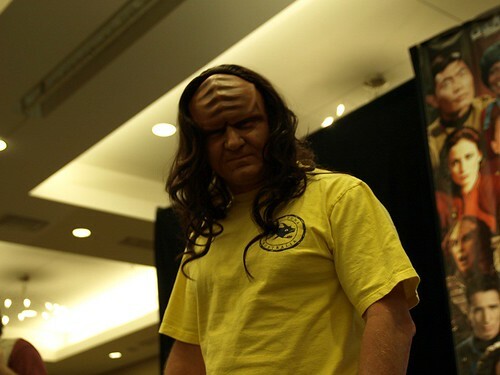 He still looks the part of Gowron to me. And if you wish to use your imagination you could just say that as a Klingon warrior he has enjoyed the spoils of battle. The next time you wish to call someone a name perhaps you should look in a mirror. Did Wolf 359 won the contest? That is an original. Wolf 359 will be the spoken picture for generations ahead. I am also relieved that they came one weekend earlier before the end of the Stanley Cup series. Congratulations, Boston. 40 Years is a long time. Last year, Chicago won the Cup. Took them 40 Years as well. Back to back, I assume. Have a great Father’s Day weekend everyone. 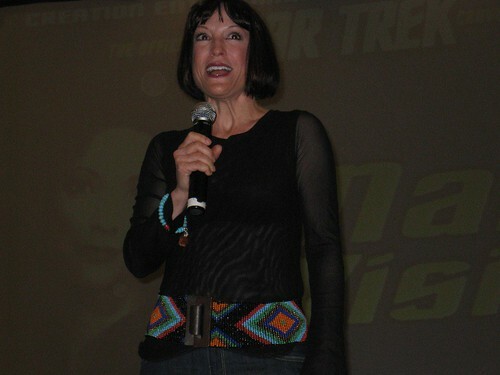 My favorite part of the con was when Nana Visitor talked about how she “lost control” a little filming a fight scene as Kira and actually beat up the visiting actress. Sounds as though it was a great weekend, wish I could have been there.